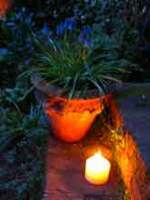 a large candle with a large wick is more resistent to wind blow. Re-fillable candle holders are available. They can be placed on stakes or on tables. Scented candles, which give an aroma while burning, are popular but more effective indoors than outdoors.